My former Prof. in undergrad Political Science subject in UP Diliman in the 80s, Dr. Segundo "Doy" Romero, asked yesterday in his fb wall, "Is Mar Roxas inclusive, principled, competent, and humble as appropriate to the Philippine Presidency?" He then defined those four concepts. 1. “Inclusive” means you, the candidate, is committed to the quality of life of, by, and for the whole Filipino people. Inclusive development means enabling the poor, the vulnerable, the marginalized, and the disadvantaged to develop faster than the rest of society. 2. “Principled” comes from a consistent code of behavior (“sa isip, sa salita, at sa gawa”) that, faced with a series of dilemmas, enables you to choose the higher interest of nation over sectarian or narrow interests. 3. “Competent” comes from doing the right things right – good technical and administrative results being consistently produced to match good intentions. This includes extending your reach beyond your grasp through teamwork and technology. 4. “Humility” is when self-praise is unnecessary; it comes from public acknowledgment that you are inclusive, principled, and competent. I commented and gave a direct answer, No. But in fairness to Mar Roxas, other Presidentiables like VP Jojjo Binay, former President Erap Estrada, Sen. Alan Cayetano, Sen. Bongbong Marcos, other presidentiables, will also have a NO answer, at least for me. Sen. Grace Poe may have humility; and competence, am not sure. With the current system of personality-oriented, not philosophy or ideology-oriented politics in the PH, no candidate can be really principled. Where the populist and welfarist idea prevails, Presidentiables and other politicians will be swayed by populism too. If majority of voters want more subsidies, more welfare, more entitlement programs, never mind that taxes are high and public debt is rising yearly because of annual deficit, with or without a crisis, most or all Presidentiables will be swayed towards populism. Being a free marketer and believer of classical liberalism (not US liberalism or other variants), the closest political party in this ideology in the PH is the Liberal Party. The LP is also affiliated with Liberal International (LI), based in Europe. European liberalism is closer to classical liberalism. My beef or complain about the LP is that it is not acting liberal enough. Many of Its policies adopted and implemented is far from being liberal but closer to the populist and welfarist philosophy. Notice how socialists like Walden Bello. Joel Rocamora, Ronald Llamas and other officers of BISIG-Akbayan found it easy to be in partnership with the LP. Either the latter group are confused socialists or the LP are confused liberals. Sir Doy asked, "Is it possible to assess the utility of political parties in terms of the outcomes they envision and actually achieve for the people and nation over a period of time...?" Maybe Yes. One problem is that all political parties here say the same thing -- "good governance", "anti-corruption," or "the current administration is corrupt, we can clean government", etc. And personality-based political parties are born. PROMDI party by Lito Osmena, REPORMA party by Rene de Villa, Aksyon Democratiko by Raul Roco, PRP by Miriam, PMP by Erap, Lakas by FVR and JDV, etc. When those leaders are gone or lie low, the party is gone or become less visible too. We cannot expect much differences among political parties and leading candidates. The visible difference perhaps is that one candidate is more vulgar in its plunder and robbery (like Jojo Binay, based on various pending and filed cases against him and his family) while the others are less vulgar. Very often, the mentality of the politicians is a reflection of the mentality and behavior of the voters, the public, mainstream media and NGOs. From some politicians that I talked to, they often say, "so many people clamor for it", referring to the entitlement and welfarism mentality. Many voters feel they are entitled to be given free healthcare, free education, free housing, free or highly subsidized credit, tractors, burial, etc. The people's values, in short, are corrupt. Many people will not admit it of course that they have corrupt minds and entitlement values. It is always easy to blame the politicians. And somehow true, the politicians take advantage of populism and entitlement mentality. How else can one justify that the government confiscates almost 1/3 of people's monthly income, and from the take home pay, government further collects many other taxes and fees (VAT on consumer items, vehicle registration tax for their cars, real property tax for their house and lot and farm, franchise tax for their business, etc.). Low-cost community schools is a way to get more kids in classrooms. Low-cost community schools are schools set up by community leaders and members to teach children from low-income families. Community schools use curricula that give parents and teachers more influence, so that schools provide their child the type of education they feel is most needed for better opportunities. Students from low-cost community schools in Asia and Africa have even done better than their counterparts in government-run schools. Proving that quality education does not need to be expensive, and can be done. For example, in India, poor families are willing to invest $2 a month to send their children to such community schools. Kids in these schools achieve higher scores in maths and english than children in public schools. Being a think tank, CIPS will conduct a major study on how public basic education in Indonesia can be made more effective and less costly. The paper, when finished, will find its way in the hands of the Education Minister and Indonesian legislators. CIPS has a working relationship with some important policy makers in Indonesia. It should be a good initiative that can be replicated in other big SE Asian countries with big population like the Philippines, Vietnam, Thailand and Myanmar. Here in the PH for instance, I think ALL high officials and consultants of multilaterals and foreign aid (UN (WHO, ILO, UNDP, UNICEF, etc), WB, ADB, USAID, etc.) plus high PH government officials and legislators, them who endlessly call for "more government spending in public education", do NOT bring their kids to public elementary and high schools, except in science HS. That alone is a clear admission by the eople working for those institutions that they have high distrust of the quality of public education. I admire and support the CIPS for this project. Friends and readers, please consider giving a donation for this project. Thank you. 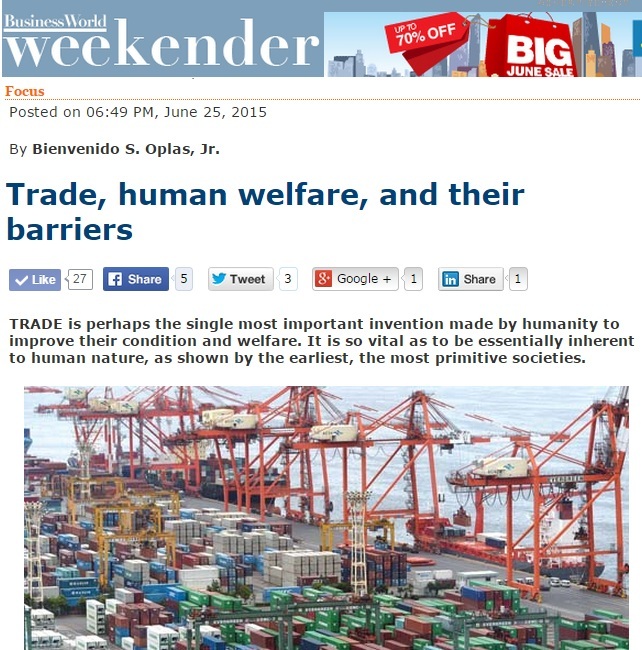 * This is my article in BusinessWorld Weekender yesterday. ELLEN is a senior accountant in one of the offices on Ayala Avenue, Makati City. She lives in Dapitan, Manila. Her father has a car that she can borrow occasionally and drive to Makati but she has little patience enduring the traffic congestion, then paying high parking fees in Makati. So she takes public transportation. If she takes the regular transportation route to Ayala, that means three rides: jeep from Dapitan to LRT Tayuman Station, then LRT to Buendia Station, then aircon bus to Ayala. Total fare would be P35 but travel time will be between 1.5 and 2 hours one way due to the traffic and the inconvenience of walking and queuing to ride the train then the bus. There is an alternative to multiple and inconvenient rides, the air-con vans. Only one ride from Dapitan to Makati, travel time is one hour or less, fare is P60 for the legal, franchised vans up to Ayala, and P45 for the non-franchised “colorum” vans that stop only at Makati Central Post Office, at the Buendia-Ayala intersection. 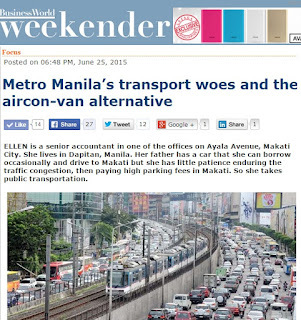 To save money, she takes the “colorum” van, gets off at Makati Post Office, then walks two blocks to her office. 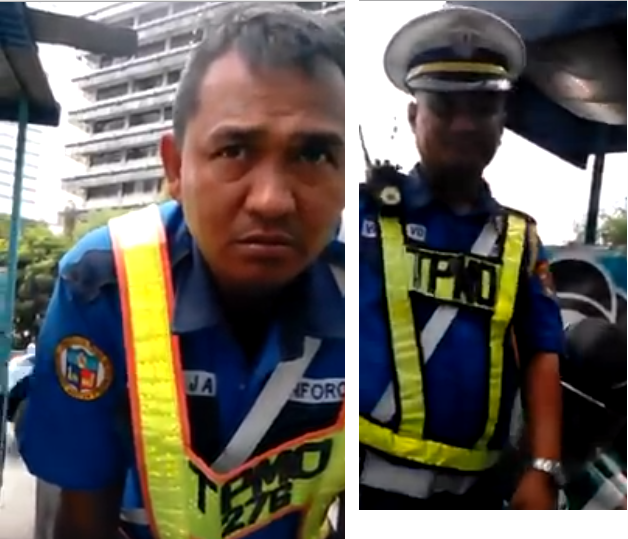 While the colorum van drivers can somehow deal with the “yellow boys,” officers of the Makati Public Safety Authority (MAPSA), they will have difficulty dealing with another bureaucracy, the “blue boys” of the Makati Parking Authority (MAPA) keeping watch on Ayala Avenue. These officers are often stricter and more inclined, shall we just say, to slapping penalties on both public and private vehicles. Being robbed in an air-con van by a fellow passenger is a possibility, of course, but that risk is minimal, compared with the risk of being robbed in a jeepney or on the streets, as one commutes from one ride to the next. It is also inconvenient, obviously, to be out in the streets when it is raining and the streets are flooded. Queuing at Dapitan can be long, because of the many residents who commute to Makati where they work, and the number of aircon vans is not enough. Normally, Ellen would be in a queue for 30 to 45 minutes until a new, empty van arrives, but she prefers the relative convenience of taking only one ride in an air-con van. 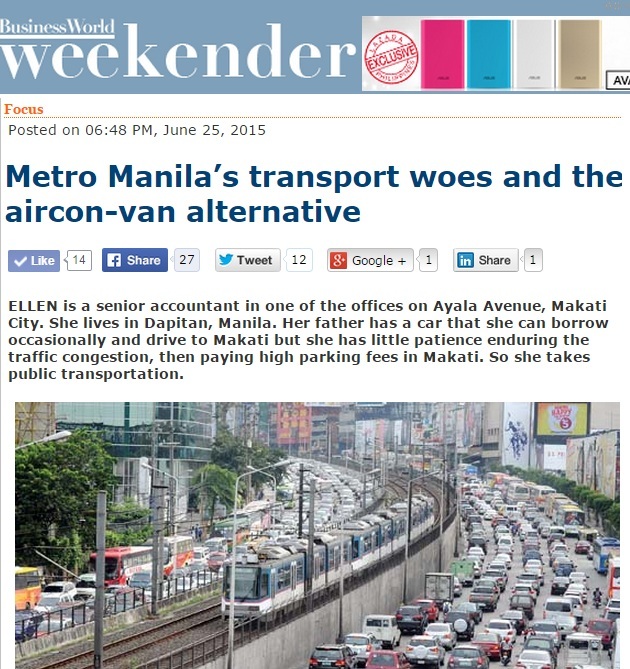 Therefore, with or without a regular franchise from the LTFRB, those vans provide real public service to regular passengers like Ellen. She feels that her energy and work productivity are higher if she takes the van than if she goes through the three-ride system or drives a car. Government officials have yet to acknowledge this view, going by the serial harassment of drivers of “colorum” vans -- who can avoid the harassment and penalties if they bribe the officers, but this “cost” is passed on to the passengers, naturally. Ellen has noticed that a number of these colorum drivers are off-duty policemen or their siblings, even officers at the usual government offices, or barangay chairmen. She believes roughly one-third of these drivers belong to those categories. Asked how she knows this, she says these drivers show their IDs, and they have these unique hand signals that traffic officers recognize to spare these drivers from their usual harassment. This is what happens when you have an observant passenger on board, as opposed to a commuter who is lost in his headset or social media. Makati’s Central Business District (CBD) is a premier area for the Philippine economy. Business groups surely recognize this distinction as sustained through the decades by their harried employees. Data from the city government’s website show that as of 2012, there are 472 banks, 3,279 insurance and other finance-related institutions, and 48 shopping malls in Makati. Data as of 2013 show that there are 41 PEZA-registered IT buildings, 47 embassies, 40 consulates, and 20 international organizations like the UN and its various offices located in the city. These banks, hotels, shops, restaurants, malls, and other establishments employ roughly a few hundred thousands of people. Those employees, from the clerical to the managerial levels, need convenient transportation to be able to arrive at their offices promptly and render efficient work. Otherwise, employees beyond the frontline services may be spared the trouble of commuting to work, but many employers are still not open-minded enough to accommodate flexible time or work from home -- options that should ease Metro Manila traffic considerably. This daily scenario is common everywhere in the National Capital Region, which, in the given year of 2013, contributed P4.29 trillion or 37.2% of P11.55 trillion in GDP. In the services sector in particular, 2013’s national output at current prices was P6.66 trillion, of which P3.49 trillion or 52.7% was contributed by the NCR. The NCR’s registered population in 2013 was 12.5 million or only 12.8 percent of the total Philippine population of 98.2 million that year. But NCR’s weekday population can soar up to 15 million, as residents, including university students, from the neighboring big provinces of Rizal, Cavite, Laguna, Bulacan, and Pampanga would troop to the NCR to do various businesses. The development of an integrated and efficient public transport system, as existing in developed economies in Asia and Europe, is the best long-term solution to Metro Manila’s traffic woes. That dream has been articulated for decades, until the gap in public transportation is now being filled by private initiative, to the chagrin of government. The absence of an efficient and integrated public transport system in Metro Manila can be considered as due both to market failure and government failure. The appearance of air-con vans and other ride-sharing schemes like Uber is a market solution to such previous market failure. Government should not over-bureaucratize and over-tax these transport innovations. By stepping back from too much regulation and taxation, government effectively renders public service. The services of air-con vans that provide workers and employees with convenient and direct public transportation, similar to school buses that transport students from their homes to school, are the next best thing for people who don’t or would rather not drive and brave the traffic. This is public service, providing an efficient, fast, economical, and safe car pooling system. But when government agencies and their officers make the franchising system of air-con vans very costly and bureaucratic, many operators skip the franchise system and become “colorum” operators. 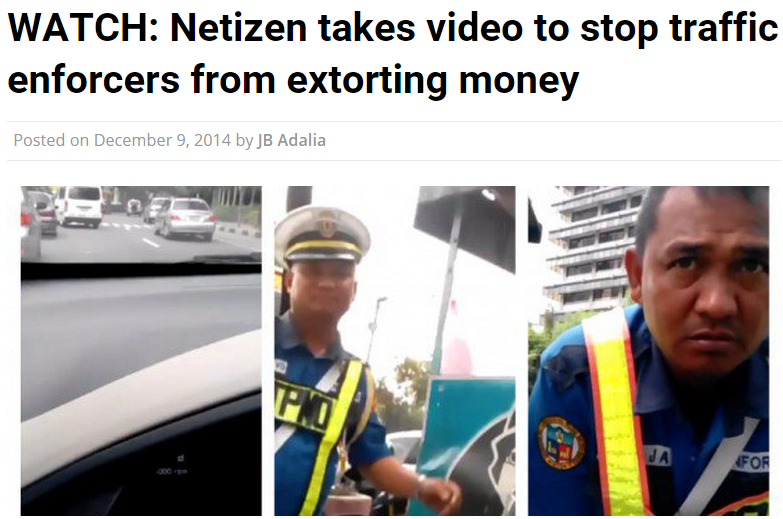 To avoid the harsh penalties and regular harassment, they must bribe traffic enforcers, and this further compounds the culture of corruption in government. 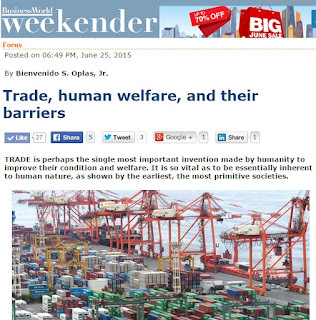 -- Bienvenido S. Oplas, Jr.
* This is my article in BusinessWorld Weekender. Posted online yesterday, hard copy is published today. TRADE is perhaps the single most important invention made by humanity to improve their condition and welfare. It is so vital as to be essentially inherent to human nature, as shown by the earliest, the most primitive societies. This is because no man, no matter how bright and resourceful, is capable of producing everything that he needs for himself and his family, especially in modern societies. Modernization is possible only through specialization of labor and skills, making efficient production of certain goods and services, generating big surplus and using the surplus to procure other goods and services that are more efficiently produced by other people somewhere else. While trade is vital to human welfare and progress, it is also the object of envy and contention among certain sectors of society in different countries. While it is human nature to have free trade among people, politics and governments come in to cater to special interests in society and deprive many consumers of the freedom of choice, by erecting various tariff and non-tariff barriers (NTBs) to trade. And this creates trade disputes among participating governments. The World Trade Organization (WTO) was established in 1995 mainly to pave the way for a rules-based global trading regime. The rules are transparent and apply to all member-countries. In a forum at the Asian Development Bank on May 21, WTO director-general Roberto Azevedo said the organization supports global trade and development via five schemes. 1. Providing a rules-based trading system that now covers around 98% of global commerce. 2. Serving as a forum where countries can sit down and monitor each other’s practices and regulations to ensure that agreements are observed and respected. 3. Offering a settlement mechanism for trade disputes between and among countries. Almost 500 trade disputes have been heard by the WTO, helping members to resolve their differences in a fair, open and transparent manner. 4. Fighting protectionism. During the 1929-1933 Depression, retaliatory trade restrictions wiped out two-thirds of world trade. Such practice was not repeated when the world experienced heavy fiscal and financial turmoil in 2008, and response by governments was mostly calm and restrained. Under the WTO, member-states knew that they were bound by rules and obligations, so they had the confidence to resist domestic protectionist pressure. 5. Providing a place where developing and least-developed countries have a seat at the table and an equal voice in global trade issues. These countries are also afforded special and differential treatment, and technical assistance to help improve their trading capacity. 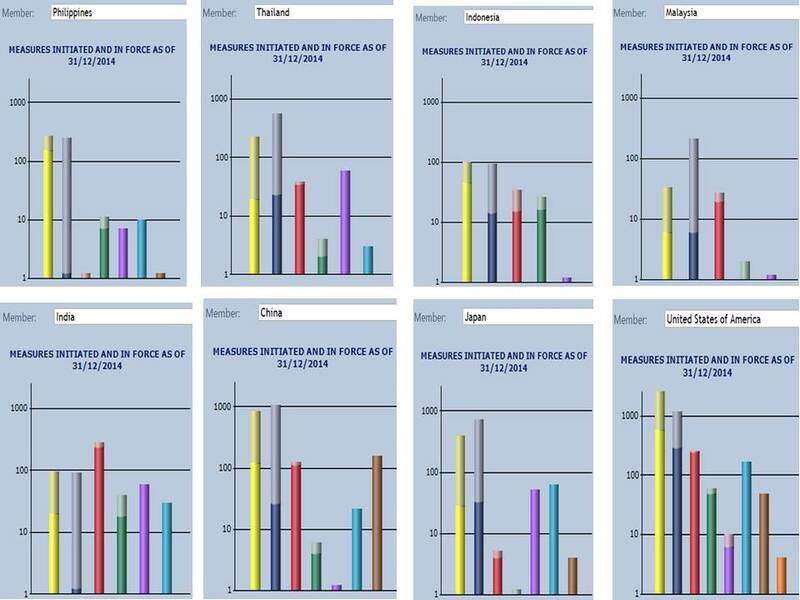 While tariffs have generally gone down across many countries, there are various non-tariff measures (NTMs) and barriers that restrict free trade. The most prominent is restriction via various bureaucracies or trade bureaucratism, a serious problem for many exporters and importers. In December 2013, a historic WTO ministerial conference in Bali produced an important output, the Trade Facilitation Agreement (TFA). Its goal is to make faster, easier, and cheaper the movement of goods across countries and borders. The WTO estimates that the TFA can reduce trade costs at the border by up to 15% for developing countries, and inject up to $1 trillion per year into the global economy, creating some 21 million new jobs worldwide. 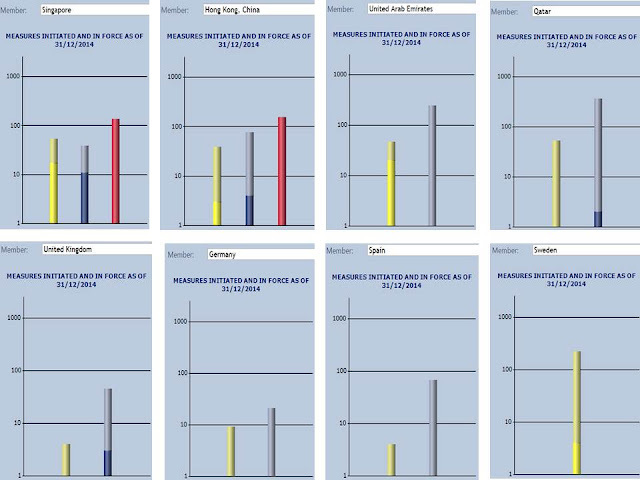 The next challenge for the WTO is the TFA’s ratification by at least two-thirds of the member-states. There are many other barriers to free trade. Here are the eight non-tariff measures (NTMs) imposed by different governments that limit or restrict the movement of goods and services across borders: Sanitary and phytosanitary (SPS), technical barriers to trade (TBT), anti-dumping, countervailing duties, safeguards, special safeguards, quantitative restrictions (QRs), and state trading enterprises (STEs). STEs are also known as state-owned/operated enterprises (SOEs) and, in the Philippines, they are called government-owned and -controlled corporations (GOCCs). In East and South Asia, the NTMs are plentiful. See these charts. In the first row are charts for the Philippines, Thailand, Indonesia, Malaysia; second row has India, China, Japan, USA. In the Philippines and Indonesia, the most common NTM is SPS. 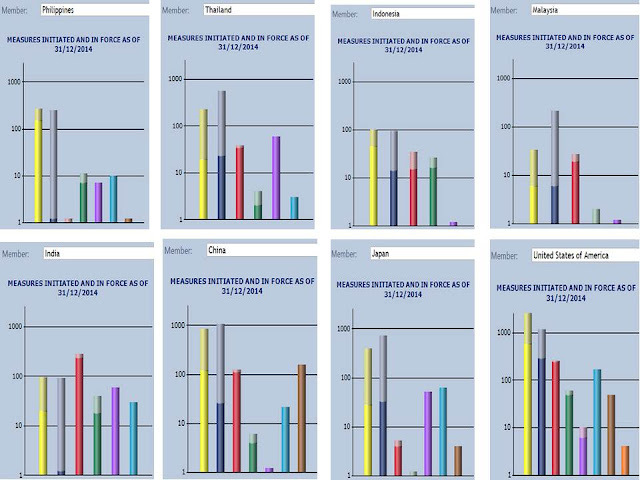 In Thailand and India, safeguards and anti-dumping are the common NTMs. China loves imposing QRs and anti-dumping while Japan’s favorites are safeguards and special safeguards. The US, falsely labeled by many people as the “chief ideologue” of the “jobs-killing free trade” philosophy, is actually a practitioner of multiple NTMs and other forms of trade restrictions. In contrast, many other economies have very few NTMs, among them, Singapore, Hong Kong, United Arab Emirates, Qatar, United Kingdom, Germany, Spain, and Sweden. Hong Kong and Singapore are the known practitioners of unilateral trade liberalization in goods in this part of the planet. Their NTMs are few compared to their neighbors in East Asia. UAE and Qatar used to be very small economies that became super rich largely through trade opening. UK, Germany, and other EU member-countries have strict observation of the free mobility of goods and people across the Union. Thus, their NTMs are very few, except for SPS measures. Freeing trade is among the most important policies that any nation can undertake to unleash the entrepreneurial skills and potentials of its people. Whether high tariffs or low tariffs but multiple NTMs, such policies deprive the people of the freedom to choose and buy those goods and services that maximize their individual and household welfare. When households make big and regular savings via purchase of cheaper, freely-traded commodities, they can use those savings and surplus to procure other goods and services that otherwise they could not buy. This expands the range of commodities among consumers and, in turn, this expands business and employment opportunities for many other people. Free trade simply expands human welfare, whether people realize it or not. Bienvenido S. Oplas, Jr. is president of Minimal Government Thinkers, a Manila-based think tank advocating free-market economics, and a fellow of South East Asia Network (SEANET), a Kuala Lumpur-based regional think tank advocating free trade in the ASEAN. The ASEAN Economic Community (AEC) will materialize in just six months, at end-December 2015. Many people both within and outside the region are excited about this common market project, composed of some 630 million people. Free movement of people and commodities, free mobility of goods and services within the 10 member-countries. That is economic freedom. But not full mobility yet, there are still pockets of protectionism especially in services, in almost all member countries. But the trend is towards gradual phase out of those non-tariff barriers (NTBs) in goods and protectionism in services. Yesterday, the team of South East Asia Network for Development (SEANET) met with Tuan Syed Nabil Aljeffri, the Secretary General of the ASEAN Business Advisory Council (ABAC). 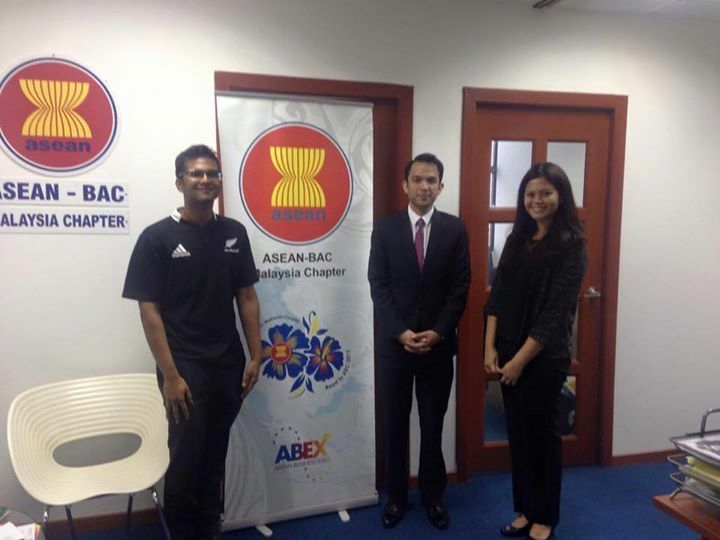 Photo below, from left: Mr. Yohannan "Yogi" Nair of SEANET, Mr. Aljeffri, and Ms. Fareeza Ibrahim, also of SEANET. In its facebook page, SEANET reported that the discussion focused on the various challenges and prospects that ASEAN and regional small and medium enterprises (SME's) face, and the necessary steps that must be taken to ensure that economic integration is equitable and sustainable in the long run. 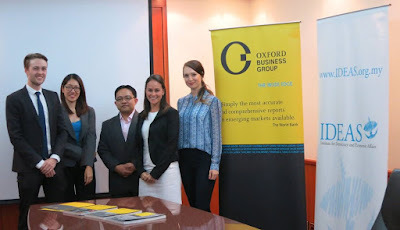 On a related note, our ally and fellow free market think tank based in Kuala Lumpur, the Institute for Democracy and Economic Affairs (IDEAS), has partnered with the global publishing and consultancy firm Oxford Business Group (OBG). The two think tanks will produce a report about Malaysia and the ASEAN economic integration. IDEAS is the "mother entity" of SEANET. It is also a member of the Economic Freedom Network (EFN) Asia. 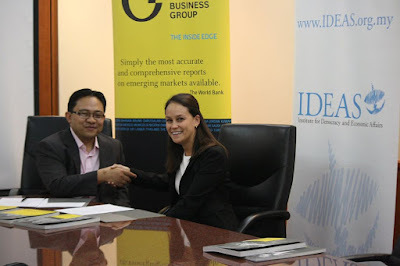 Photo below, IDEAS CEO Wan Saiful Wan Jan and OBG’s Regional Manager for Asia Lauren Denny. The Report: Malaysia 2016 will provide detailed analysis of what the launch of the ASEAN Economic Community at the end of 2015 signals for both the regional and global economy. The publication will chart ASEAN’s drive to ensure people and their needs remain the top priority in the nations’ efforts to promote regional cooperation and solidarity. Other issues set for coverage include ASEAN’s push to boost the part played by small and medium-sized enterprises (SMEs) in regional economic development and its efforts to promote more public-private sector partnerships (PPPs). In other analysis, The Report: Malaysia 2016 will explore the achievements of the 10th Malaysia Plan, as well as the launch and goals of the new 11th Malaysia Plan which will lead the country to Developed Nation status by 2020.The publication will also shine the spotlight on the Malaysian states of Sabah and Penang, where there is evidence of significant economic potential; as well as the opportunities for foreign direct investment (FDI) emerging across many of the sectors of the country’s economy. The Institute for Democracy and Economic Affairs (IDEAS) has signed a Memorandum of Understanding (MOU) on research with OBG for its forthcoming report on the country’s economy. Under the first-time MOU, OBG will work with the leading think-tank, which promotes market-based solutions to public policy challenges, to compile and produce The Report: Malaysia 2016. Wan Saiful Wan Jan, Founding Chief Executive of IDEAS said he is excited to contribute to The Report especially this year as IDEAS has just started their project on ASEAN. "This is an exciting time for Malaysia and for the region. The birth of the ASEAN Community and the ongoing negotiations around the TPP hold huge potential for growth in this region and if done correctly Malaysia will certainly benefit from them. The government too has introduced some important structural changes in our economy which shows their commitment to improve the investment climate. My team has been looking into these issues and we are very keen help OBG capture these important developments in The Report." OBG’s Regional Manager for Asia Lauren Denny said she was delighted that the Group’s team in Malaysia would benefit from IDEAS’ local knowledge in what marks its ten-year anniversary of analysing the country’s economy. The Presidential and local elections in the Philippines are just 10 1/2 months away. Generally it will be a battle between which side of Big Government advocates will prevail. Nonetheless, we can delineate or distinguish them which side will advance Big Government + Big Private Monopolies and Oligopolies, vs. Big Government + Competitive Economy. 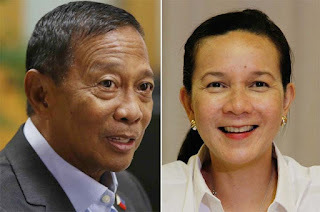 I think the old and traditional politicians like VP Binay belong to the former while newbies like Sen. Grace Poe may belong to the later, am not sure. What about good governance? 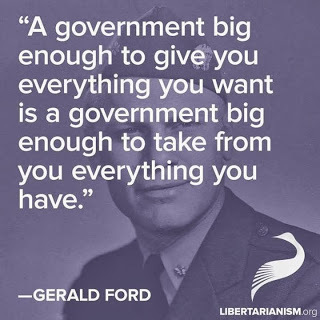 For me, Big Government = bad governance There is little or no justification why bureaucracies, regulations, permits, taxes, fees, fines, mandatory contributions, etc. should be as many as possible. In the absence of a political party in this country that advocates limited and small government, free marketers like me can only compromise with candidates or political parties that somehow advocate more economic freedom and less monopolies, oligopolies, which are always created by government via Constitutional restrictions and franchising system. This article by my former Prof. in a Political Science subject in UP Diliman in the 80s, Dr. Segundo "Doy" Romero, is another sharp analysis and can help guide voters who among the different political parties and factions can advance more economic freedom and who can oppose it. Sir Doy posted this in his fb wall, reposting with his permission. The resignation of Jejomar Binay from the Cabinet of President Aquino is a declaration of war. Now the campaign for the Presidency in 2016 is unofficially open. The battle lines are drawn. Consolidation of forces begin. The Binay declaration of war is timed to prevent other opposition contenders from prematurely declaring and committing themselves to the fight for the Presidency. If they do, it will take time and a lot of resources before they and their core supporters can be cajoled to give up their presidential ambitions and agree to put themselves behind Binay. That would waste at least six months of preparation for and conduct of war. Now that Binay is the default leading opposition contender, he can now begin to consolidate the fragmented opposition. He is hopeful despite the polls showing he is steadily losing the people's favor, for he finds himself in fertile opposition ground. PNoy has so changed the political landscape that he has created powerful enemies among the traditional elite and political families. These families, while themselves competitors and rivals for slices of political and economic power, are willing to set that aside at this time, just to bring back the old rules of the game of politics where they perform exceedingly well..
At this early point, there is also a big chunk of the electorate who are unattentive, just observers or hecklers of the passing political scene, who are yet uncommitted, perhaps as much as 60 percent of the electorate. The polls show they are the voters who are lower in socio-economic status and farther from Manila. They are in the middle between the Binay camp and the Poe camp. They are the Middle Earth. This is a source of hope for Binay. The Binay touch had shown wonders here in the 2010 elections, using local government officials and leaders to transact electoral support the way cobradors of jueteng fan out to the countryside. Binay's assets are frozen and, under the watchful eye of the public, cannot be renewed or augmented through public coffers as in the past. He needs the subscription of various investors and stakeholders to his campaign. His promises will be weighty, because Grace Poe, will not be willing to enter into these sweetheart deals, using the Presidential prerogatives as a futures commodity to be traded. 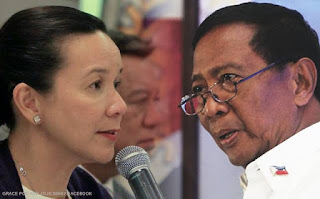 The reason Grace Poe has edged Binay from the presidential preference polls is that she has served as the consolidation point for all those who advocate for continued good governance and rejection of corruption. The Binay declaration of war simply creates a parallel, symmetric consolidation around two opposite poles -- the experienced but tainted, the inexperienced but principled. For the first time since the Ferdinand Marcos-Cory Aquino face-off in 1986, we will have another face-off between just two major opponents -- Binay and Grace Poe. .Any other candidate will serve to be a muddler -- serving only to draw votes from any of these two primary contending forces. Mar Roxas and Duterte are in this category. SWS and Pulse Asia, working independently but validating each other's reading of the people's political pulse, will ensure that no politicians will be blinded with illusory hopes of personal grandeur. With social media as the new powerful channel of information between candidate and voter, the 2016 elections will be the neatest, sharpest reflection of the people's will in a long, long, time. It will tell us whether the Filipino people essentially judge on the basis of the "aliwalas ng mukha" factor, or the "lalim ng bulsa" factor. For the first time since Cory Aquino, the Philippines is poised to have a majority president in 2016. The question is, Binay or Poe? I already have my answer, and it makes me smile. * This is my article for Media 9's business magazine in Kathmandu, Nepal, May 2015 issue, column on "Free Market." Economic liberalization, such as having freer trade in goods, freer mobility of people and services, a better flow of investments and capital across countries and continents, almost always unleashes human potentials and talents. Where there used to be “impossible” mindset, slowly they become possible as economic, social and cultural changes unfold. 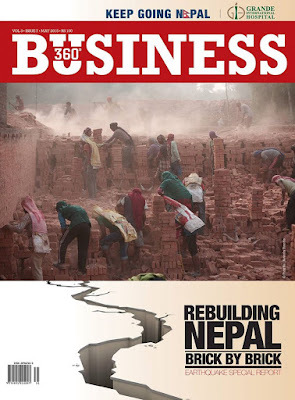 South Asia has huge potential, mainly because of its huge population and diverse geography -- from world-class beach resorts of Maldives to the scenic mountains of Bhutan and India, up to the sky-hugging Himalayas of Nepal. What land-locked countries lack in terms of access to the ocean, they make up with mountains that can easily attract visitors and investors from around the world. The infrastructure to make this happen, such airline liberalization and competition, airport modernization and electricity supply stabilization, should be put in place. The International Monetary Fund (IMF) released its annual World Economic Outlook report in mid-April this year. It points out some interesting points, such as the fact that in the Purchasing Power Parity (PPP) valuation of Gross Domestic Product (GDP), China has overtaken the US in 2014 as the world’s largest economy. In terms of nominal values though, the US is still number one. 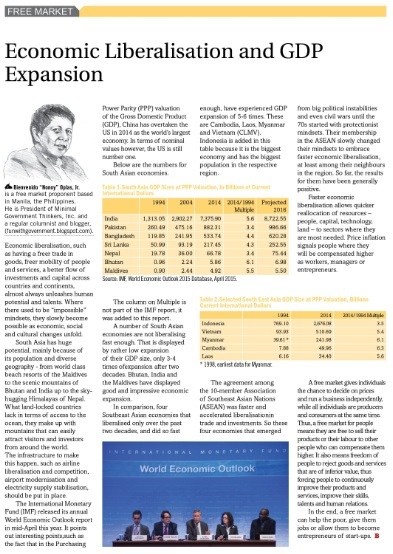 Below are the numbers for South Asian economies. Source: IMF, World Economic Outlook 2015 Database, April 2015. The column on Multiple is not part of the IMF report, it was added in this paper. A number of South Asian economies are not liberalizing fast enough. That is displayed by rather low expansion of their GDP size, only 3-4 times of expansion after two decades. Bhutan, India and Maldives have displayed good and impressive economic expansion. In comparison, four South East Asian economies that liberalized only over the past two decades, and liberalized fast enough, have experienced GDP expansion of 5-6 times. These are Cambodia, Laos, Myanmar and Vietnam (CLMV). Indonesia is added in this table because it is the biggest economy and has the biggest population in the respective region. * 1998, earliest data for Myanmar. The agreement among the 10-members Association of South East Asian Nations (ASEAN) was faster and accelerated liberalization in trade and investments. So these four economies that emerged from big political instabilities and even civil wars until the 70s started with protectionist mindsets. Their membership in the ASEAN slowly changed their mindsets to embrace faster economic liberalization, at least among their neighbors in the region. So far, the results for them have been generally positive. Faster economic liberalization allows quicker reallocation of resources – people, capital, technology, land – to sectors where they are most needed. Price inflation signals people where they will be compensated higher, as workers, managers or entrepreneurs. A free market gives individuals the chance to decide on prices and run a business independently, while all individuals are producers and consumers at the same time. Thus, a free market for people means they are free to sell their products or their labor to other people who can compensate them higher. It also means freedom of people to reject goods and services that are of inferior value, thus forcing people to continuously improve their products and services, improve their skills, talents and human relations. In the end, a free market can help the poor, give them jobs, or allowthem to become start up entrepreneurs. I do not want to do serious political analysis of the coming May 2016 Presidential, Senatorial and local elections in the Philippines for several reasons. First, my hands are full with other papers to write and I often miss deadlines. Second, there is no single free market-leaning national candidate or political party. And third, there are so many analysts of this subject around, it is entertaining to read them, from the sensical ones to the absurd. So I resort to reposting the ideas of some friends whom I think make useful analysis. Below, some random thoughts posted by a friend way back from UP Diliman in the 80s, Bernard Ong, in his fb wall. Reposting these with his permission. Serge Osmena is the premier campaign strategist of the Philippines. Local version of Karl Rove or David Axelrod. He saved the Pnoy candidacy in 2010. Villar was polling well vs Pnoy, until Serge took over the campaign management & messaging. Here's what he has to say for 2016: Grace Poe should run as an independent. She can win w/o a party. Like Miriam or Roco before, plus the FPJ magic. Poe should drop Chiz. He will be a baggage to Poe for people who don't like him. Exactly my thoughts. The added bonus is she can govern w/o political debts afterward. Our current party system is a joke - local parties are mainly a mix between personality cult, marketplace for exchanging political favors, and exclusive club for rich families. Binay went to 3 markets in Antipolo - shaking hands, asking for votes, giving away wheelchairs & T-shirts with his face & slogan. Typical trapo & epal stuff. HIndi daw campainging. Part daw ng kanyang official duties (which are Housing & OFWs). Law on premature campaigning is flawed. It only covers acts after one files his candidacy. Any campaigning before that is allowed. It should be amended to cover retroactive acts by eventual candidates. Meanwhile we should not vote those who use technicalities to go around the spirit of the law. Like this thief & liar. Biggest gainers in lastest survey: Poe & Duterte. Biggest losers: Binay & Others. Shortlist seems to be Poe, Duterte, Binay, Roxas (unless he drops out). Erap only comes in if Binay can't run. Otherwise, he "endorses" Binay but his followers vote FPJ/Poe. Poe can win this 1-on-1. Or 1-on-3. Duterte not so because of narrower base & appeal. Nice to have both "outsiders" trending positively. Major parties (UNA & LP) should be on panic mode. All the e-pal, premature campaigning & preemptive strikes aren't working. Probably thinking of Plan B which is PCOS & Smartmatic. Drilon said "No party convention needed. Mar is the man." Good. I'd like Mar to run for President. It will cure his itch & redistribute some of that fabled Roxas-Araneta-Ayala wealth. More important, it will keep Grace Poe free of Liberal Party baggage. Beyond May 2016, those responsible for PDAF, DAP & Mamasapano should be held accountable. Without political debts to worry about. 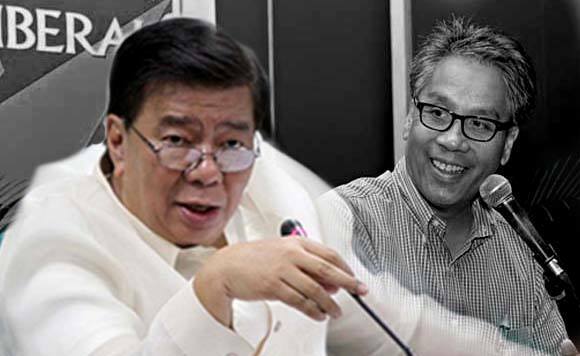 "A P-Noy endorsement of Roxas is clearly a secret vote for Binay. Roxas is one weak challenger to Binay and it is doubtful public sentiment will drastically change." It is Poe vs Binay now. I've said this before: Poe can beat Binay 1 on 1. Poe can beat Binay + Roxas + Duterte 1 on 3. Machinery is over-rated. The game has changed. Binay's preemptive strikes (residency, citizenship) & half-baked apologies backfired big time. It firmed up Poe's resolve. And changed the storyline from Binay-vs-Others (where he had a comfortable lead) to Binay-vs-Poe. Or more accurately Looter-vs-Orphan. Unwinnable for him without Smartmatic intervention. In effect, Binay annointed Poe to be the anti-Binay alternative. Drove most of the "Anybody But Binay" millions into one candidate. Under the spotlight, Poe parried the attacks skillfully. And now we have Poe-vs-the-Rest. Salamat Toby Tiangco! Personally, I wish that Sen. Grace Poe will run for President. Her being a "newbie" compared to Binay, Roxas, Duterte, Estrada, etc. is for me, an advantage. It means less political baggage and old compromises. When a candidate is financially- and politically-indebted to certain economic interests, it is hard to decline their political and business "requests." Thus, it is easier for that "newbie" to further advance trade and investment liberalization in the country than candidates who were long indebted or engaged to local monopolists, duopolists and oligopolists. 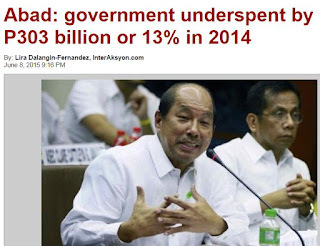 Abad attributed the sluggish spending mainly to the "structural weaknesses within national government agencies and government owned-or-controlled corporations (GOCCS), (42 percent); peculiar problems of small agencies (30 percent); savings generated from lower interest payments and net lending (14 percent); others reasons beyond the control of the agencies (12 percent); refocusing of efforts to Yolanda rehabilitation and recovery (1 percent); and, unutilized funds due to the Supreme Court decision on the Priority Development Assistance Fund and the Disbursement Acceleration program (DAP), (1 percent). 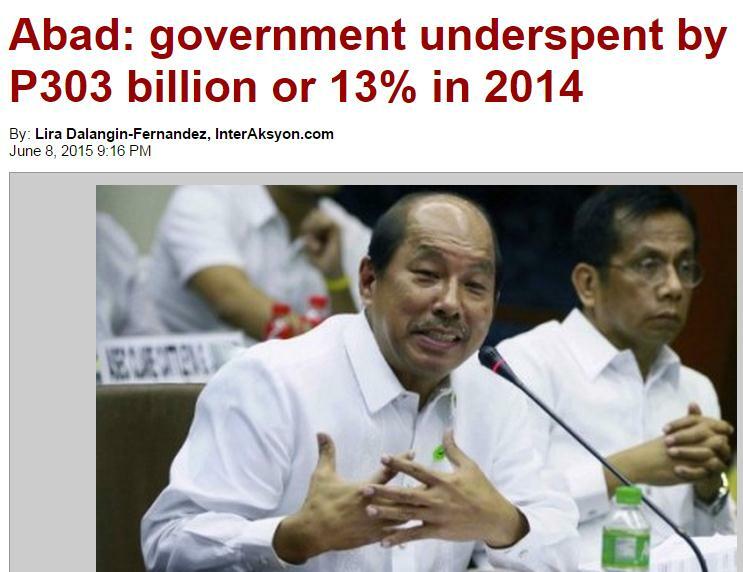 The budget for 2014 was P2.4 trillion. Among the unreleased appropriations for agencies in 2014 were for major departments such as Department of Education (P2.2 billion); Department of Public Works and Highways (P26.3 billion); Department of Agriculture (P2.6 billion); Department of Agrarian Reform (P5.8 billion); and Department of Environment and Natural Resources (P1.9 billion). The headline of course is wrong. No administration in the country since Marcos (then Cory, FV Ramos, Erap, Gloria, PNoy) knows how to "underspend", to have fiscal surplus during period of no crisis and pay previous debts incurred during crisis or financial turmoil years. Each year, government over-spends, expenditures > revenues, always, resulting in annual budget deficit and annual borrowings. Here is the annual budget deficit, 2000-2014. Average around P180 B a year. With annual deficit, there is annual and endless borrowings. The PH public or government debt stock keeps rising by an average of P192 B a year from 2004-2014, with or without a crisis. Meaning the PH government, regardless of administrations, just keeps the spend-spend-spend, borrow-borrow-borrow policy. Governments must learn to underspend, to have fiscal surplus during non-crisis years and pay back some old debts. Another physician friend commented that the DOF and DBM "do not want to invest in more health human resource in the face of a growing population. The primary care coaltion is lobbying for more Health human resource, with decent and attractive compensation, and the government answers with a small govt paradigm, cutbacks and contractualization disguised as "rationalization ".imagine what we could have done with P303 billion in advancing universal health care." Hmmm, "a small govt paradigm, cutbacks and contractualization", he could be referring to Hong Kong. The PH is definitely among the big government models. Combine the cost of national govt + local govt + government corporations (GOCCs, like SSS, GSIS, PhilHealth, PagIBIG) + cost of compliance of various regulations, the cost is big. 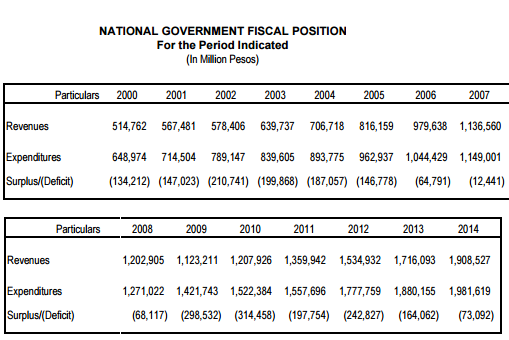 Besides, P192 billion a year net increase in public debt stock with or without a crisis is not enough? How much do they want, P300 B year, P500 B a year, increases in public debt? The "underspending" of P303 billion in 2014 was not directly used to pay our public debt, but rather, it represented money that should have been borrowed and the borrowing by that amount did not materialize. It is understandable that the health sector will lobby to use that "underspent" P303 billion for more health spending, like hiring more health human resource as "we don't even have 1 midwife or nurse per barangay." One problem is that DepEd cries "we need more money", DA and DAR cry, "we need more money", DILG and PNP cry, "we need more money", DPWH and DOTC cry "we need more money", etc. Another comment suggested that "Underspending is not a sign of good governance. It's a sign of bad budgeting and neglect of duty." This is one clear proof that it is not only the government officials and legislators who love fiscal irresponsibility, but many in the public too, including many professionals. For them, government annual over-spending, living beyond its means, endless borrowings, is a virtue so long as the money goes to their favorite sector/s. Consider this: A person who earns P100k a month but spends P110k a month, with or without health emergencies and borrows P10K a month on average will be called "mayabang", "maluho", "magarbo", "hindi marunong magtipid", "palautang", other unkind adjectives. But when a government does the same, it is ok, it is fine, it is good governance. There is double standard and double talk here. In this example, that irresponsible individual can finance his endless borrowings by selling some of his assets and properties, or resort to stealing from other people, then pay his debts. An irresponsible government can finance its endless borrowings also through large-scale privatization of its assets and corporations, or resort also to stealing -- from the pockets of future taxpayers. Whether they steal from current or future people, it is a criminal act. Finally, about this "more public spending in healthcare means better health outcome" hypothesis or theory. I am really curious about the case of Manila city. It has a total of 10 government hospitals -- 6 city hospitals, 3 DOH hospitals, and 1 UP PGH. Per sq. km. of land, it has the most number of government hospitals and hence, has the most number of government doctors, nurses and other health professionals in the country. In addition, it has barangay health centers + clinic within city hall + private hospitals giving subsidized treatment to indigent residents of the city. Is there an existing study/ies showing that the residents of Manila City are the healthiest people in the PH? I doubt it, but in case there is one, I want to see that paper. This story was reported by Kicker Daily News last December. It's about some traffic enforcers in Ortigas Center, Mandaluyong City, Metro Manila, who extort money from hapless motorists. Vehicles going to Edsa should be in the middle to right lane. The traffic officers would flag down motorists in the middle lane and insist that they were using the left lane and hence, should be penalized for traffic violation. It is time consuming to argue with these officers, and even more time consuming to redeem one's driver's license at their office + pay the penalty. So they extort money and they will let go of the motorists. The motorist who posted originally in facebook, David Kilpatrick, has been extorted previously, P500. The practice is repeated, so one day he took video of the two officers, shown above. The one directly facing the camera is JA Cruz, Traffic and Parking Management Office (TPMO) #276. His buddy's name was not captured by the camera. After their faces have been reported in media, one may expect that these guys may have been suspended or sacked already as their acts would negatively affect TPMO Mandaluyong Pasig City. This did not happen. Today, a friend way back in Congress, Jojo Menorca, posted and positively identified these two officers who flagged down his daughter two weeks ago for the same accusation against Kilpatrick, and tried to extort P2,000 from her. Itong dalawang tarantadong ito ang nanghuli sa anak kong si Elysse Toral Menorca dyan mismo sa ORTIGAS two weeks ago. Same situation. Nasa mid lane sya at iniinsist ng mga ito na me violation siya. I am sharing this para makita nyo mga pagmumukha ng mga hayup na ito. Akala ng mga ito e matatakot sa kanila ang anak ko. Kinokotongan nila ng P2K para di na raw maabala. I told her over the phone na wag siya aalis kung saan siya pinara until I get there to challenge these 2 idiots sa sinasabi nilang violation. Dahil palaban ang anak ko, nakipag argue siya at hinahanap niya ang karatulang sinasabi nila na bawal dumeretso ng Edsa ang galing sa Ortigas. Elysse went down her car and took picture of the signboard that says something like "Vehicles in the inner lane must turn left to Meralco Ave." So, where is her violation? She is in the middle lane and not in the inner lane? Sensing na walang mangyayari sa pakikipag argue nila sa anak ko, they let her go without giving money to these two CORRUPT TRAFFIC ENFORCERS. Buti nga hindi sila nakatikim ng mura sa anak ko e. Kahit timid anak ko palaban yun! Look at how they cover their NAMECLOTH with accessories. Many government personnel especially in local governments have acquired that extortionist culture. Here's what they do: they create many Nos, prohibitions and restrictions on the roads -- No left turn and No right turn on red, No U-turn here, No Parking or Waiting there, No Loading here, No Unloading there, etc. Sometimes the left or U-turn slots are far away or in traffic-congested areas, enough to cause inconvenience to motorists. Some drivers who want to avoid getting stuck in heavy traffic try their luck and take the nearest open intersection, and that's where the "public servant" traffic officers come to harass them, impose fines and penalties + deliberate time consuming process to redeem the driver's license. Motorists will be pressured to pay the extortion that they demand. As government expands, opportunities for extortion also expand. Hence, the need to stop further and endless expansion of the government, local and national.